We love it when one of us transitions to published author and writes the guest post during launch week. What a thrill. Lisa’s novel is the second to fly free. Fly, KILMOON, fly! Since Lisa just wrote her regular Friday post yesterday, she elected to do an interview today. Each of the debs asked her a question. Welcome, Lisa! LORI: Which part of publishing your first book is exactly how you pictured it would be? Which part has surprised you? I had a feeling that asking for blurbs was going to be nerve-racking and indeed it was. The big, boring task of reading the final page proofs was just as boring as I’d imagined. (By then you’re thinking, Enough already! I can’t stand this book anymore!) Getting a good review was just as thrilling as I thought it would be too. I was surprised by the editorial process in general—the changes that kept coming. And coming. Copyediting and proofreading were eye-openers. I think of myself as a pretty clean writer, but, eh-hem, I have issues with certain things like dashes. And then those dang page proofs. I thought for sure the proofs would be clean. No big deal. But I STILL found typos. Grrr. 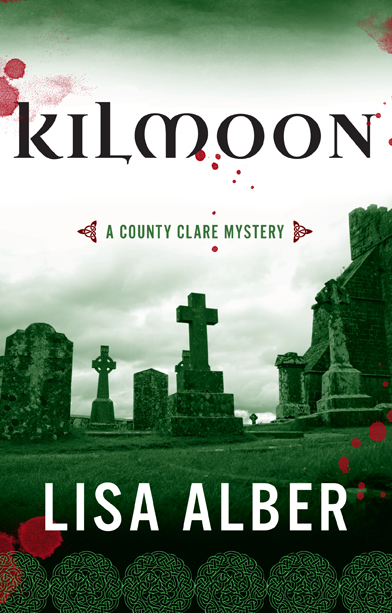 NATALIA: How many books are planned in the County Clare Mystery series + what’s the most fun part about writing a series? What’s the most challenging? I originally thought this might be a trilogy because there’s a natural end that could occur. In fact, I painted myself into a corner by the end of Kilmoon. A fact about one of my characters implies a natural end point to the series. However, I’ve been thinking hard, and I might have discovered a way to wiggle out of it. I love knowing my series characters so well. They’re like family. Lisfenora village is a nice place to come back on the regular basis. There are multitudes of villagers I don’t know yet that could come into play in future books. I look forward to meeting them. On the other hand, knowing how much backstory from KILMOON to include in the second novel, my work-in-progress, is proving challenging. SUSAN: What word of advice do you have for other authors about to launch their first book … Like me, next week?? HEATHER: How has your life changed since you became a bonafide author? Bwa-haa-hah-hah-hah-hah, oh my, <hiccup> … <snort> … I feel just as neurotic as usual, so I guess nothing much has changed. I still have all my usual doubts when it comes to the work-in-progress, for example. But, let’s see. I can be serious even though I’m feeling punchy. I’m not a prideful person–my ego doesn’t roll that way–but I am honest-to-god proud of myself, and that’s a change at the soul level. Because I did it–I dared to go after a hugely difficult dream, to persevere, to make personal sacrifices for the sake of my writing goals, and to stretch my comfort zones in significant, sometimes terrifying, ways. Do you, gentle readers, have any questions for me this week? Ask me anything! GIVEAWAY! Comment on this post by noon EDT on Friday, March 28, and you’ll be entered to win a copy of KILMOON. Follow The Debutante Ball on Facebook and Twitter for extra entries—just mention that you did so in your comments. We’ll choose and contact the winner on Friday. Good luck! My question is this: How much of your decision to write a series was an artistic choice, and how much of it, if any, was a commercial one? I have heard reports that publishers strongly urge mystery writers to write series (one writer I knew said that her publisher refused one book unless she promoted it as the beginning of a new series). Hi Anthony! Good question. Funny, it was an accidently commercially (yikes, to adverbs — oh well!) sound decision. 🙂 I made the decision at an emotional level. I’d written KILMOON as a standalone — no thoughts of a series at all — but then afterwards I realized that I loved my characters, and best yet, I’d left them in transitional places in their lives (even though everything resolves). I wanted to see what would happen next for them. Decades! You must really know your characters backwards and forwards. You’re the one to give lessons in how to write a series! Well, like you, I didn’t set out to write a series of anything; it just developed that way. And it’s not a series like Sherlock Holmes or something. Only some of them are mysteries — but the detective is in everything I write, mystery or no. I’ve been following the blog for about 8 months now and it’s been a thrill to watch you go through the process. I particularly liked your post about the different versions of the cover. It was fascinating. Just this week I got asked for my full manuscript from an agent so I am hopeful (and terrified) I’ll be on your path soon. Enjoy the moment! And congratulations. Congratulations, Debbie! Crossing my fingers! Whatever happens, just know that it’s a huge thing to get asked for the whole manuscript. Really, it is. It is kind of terrifying, but so worth it! Lisa, it’s so cool that the book you were just in the early stages of researching/imagining 10 years ago when we talked about it has been published, and that you’re already well into the 2nd book. I’m just so happy for you, and your blog posts are always so interesting and fun. It’s such an insight into the whole process. In addition to your personal blog, I’ve been reading the The Debutante Ball for a while, although I just started officially “following”. Andy! You’re so sweet. (Can’t wait to see you soon!) Hmm … Who should play Merrit? I keep picturing the actress from Firefly/Serenity — forgot her name. However, she doesn’t look particularly Irish, does she? I’m so excited for you, Susan! I love series with the chance to watch the characters grow. I hope you find that wiggle room. It’s also nice to hear Kilmoon is going to be a series, I love following characters from one book to the next – really prefer that to stand-alones. With all the business of launching Kilmoon I can’t believe you have the draft ready for the 2nd book – how do you do that? I’d go mad with so many balls in the air – I’m serious, I would go nuts! Writers must really love to create stories, luckily for us who read. It’ll be a treat to follow you on your journey – I’ve certainly enjoyed it vicariously so far. Hi Hannelore! Ah, my life was simpler when I wrote KILMOON and the first draft of the second novel–I was a contractor who worked from home and made my own schedule. I’m still getting used to juggling day job and fiction writing. To tell you the truth, I don’t know how I’m going to juggle it. Thankfully, the self-promo-y stuff for KILMOON is going to die down. I can’t wait to get back into a regular writing routine! You had quite a week, Lisa! So glad to have been a part of it. I’m freaking exhausted — still! I’m so glad you were a part of it. Can’t wait for your launch! Congrats, Lisa. I’ve followed your journey here, on Twitter, and FB. I have several friends launching books this year and I find all the work both inspiring and intimidating. Good luck with the second book.